Paella. Served in a shallow steel dish with two handles called a paellera, paella comes in all varieties, including seafood, mixed, and Valencian. No matter what the variation, this dish always includes rice, meat (or seafood), and vegetables. Other popular ingredients include beans, olive oil, and saffron. If your order comes with squid, don’t be surprised if the rice (and everything else) is black from the ink. Flan. Even if you’re not a fan of this trademark Hispanic dish, give it a try in Spain and you may change your mind; it’s much sweeter than other varieties found in Mexico or Central America. Made with eggs, sugar, and sweetened and evaporated milk, it’s a great way to finish a meal. 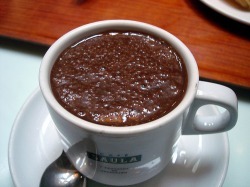 Spanish hot chocolate. Since this hot chocolate really needs to be imbibed with a spoon, this thick drink was made for chocoholics! Coffee. Spaniards are coffee drinkers, so if you prefer tea you’ll probably have a harder time finding different varieties. Keep in mind that if you order just café, you’ll be served espresso! If you order café con leche you’ll get a more popular form of coffee with milk. 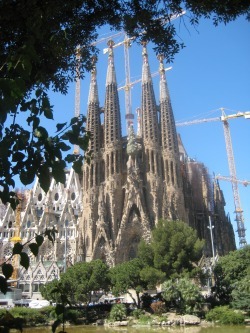 The Sagrada Familia church. This Roman Catholic church has been under construction since 1882 and isn’t scheduled for completion until at least 2026! Considered Gaudi’s masterpiece, the building is one of the most amazing pieces of architecture in the world and its size is difficult to convey. Upon completion, there will be 18 towers, the highest of which will reach almost 560 feet tall. You must see it for yourself! A bullring. You probably want to avoid the actual bullfight if you are an animal lover and/or have a weak stomach (as the intent is to kill the bull), but the history associated with Spain’s oldest and most popular sport, which many consider an art form, is very interesting. The tower built for the 1992 summer Olympics. Although actually built to transmit the games over television, it resembles an athlete carrying the Olympic torch. Visit Parque Güell. Also designed by Antoni Guadí, this park will most likely be the strangest one you’ve ever visited. Complete with mosaic sea serpents, curved tiled benches, and stone walkways, the experience is truly eye-popping. Walk along La Rambla. This three quarter mile stretch of tree-lined street is always full of living statues and endless shopping options. This street is popular to both locals and tourists, so be extra careful of pickpockets. Try and catch the Sardana dance. This circular dance, in which dancers hold hands while performing, is typical of Barcelona and is performed by groups of people in front of cathedrals on Sundays or in town squares during festivals.